For the bargain basement price of only $140, we can paralyze your face, or more!. Trust us – it’s a great deal! What could possibly go wrong??? 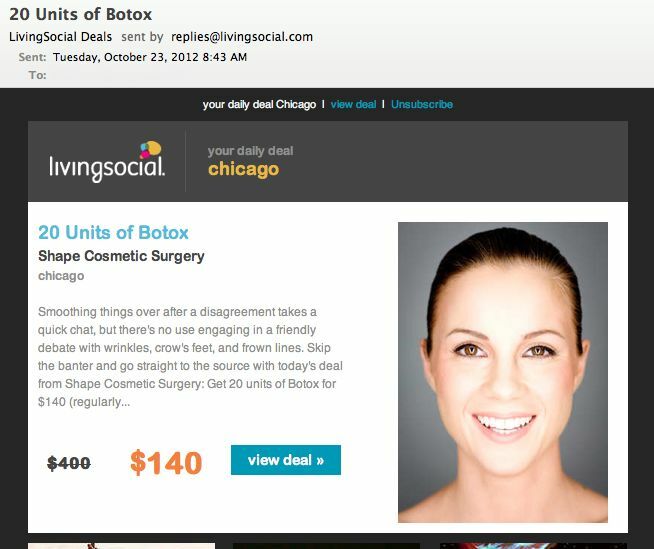 What kind of person is comfortable doing discounted plastic surgery, from an email ad? I’m leery of even using discounted restaurant ads, much less something that could permanently paralyze my face. How much longer until the herd of “discount and deal” sites starts to thin? Not that I have anything against Groupon, but it sure seems (based on this email offers and others) to me that this concept has officially jumped the shark. This entry was posted in Is it just me... and tagged Botox, Groupon, Living Social, Plastic surgery, What could possibly go wrong?. Bookmark the permalink.